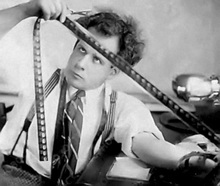 Last Thursday, after Meg Rorison‘s in-class visit (and screening of her short films) we discussed Sergey Eisenstein‘s “shooting script” for a Pushkin stanza, where he breaks up the poem into the scenes or images, divided by cuts instead of line breaks. Over the weekend, some of the students went to the animation shorts and other short films at Artscape, as part of the Maryland Film Festival. And today, we’re going to be shooting at the Homewood Museum on the JHU campus. Footage the students film will become part of the video design / projection design for a performance to take place there on August 12. The students’ third film was to have been due Tuesday (today) but we pushed back the deadline so they could all take part in the shoot today and be relaxed about the deadline. So we’ll workshop their final films for the class on Thursday instead. Finally, after the shoot today, we’ll have our last in-class visitor: Baltimore filmmaker Adam Gray.